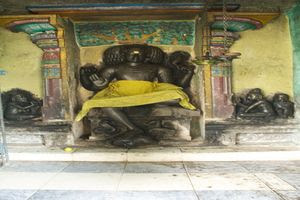 This is the 43rd sthalam on the southern side of river Cauvery. 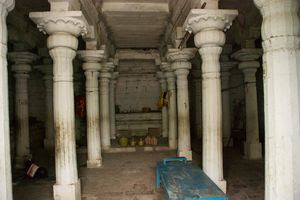 Moovar has sung hymns in praise of Lord Shiva of this temple. 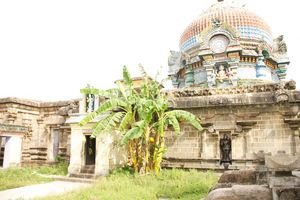 Natrunaiyappar Temple is a Hindu temple dedicated to Lord Shiva, located in the village of Ponsei or Thirunanipalli (Chola Nadu - South of Kaveri), Nagapattinam district, East-Central Tamil Nadu, South India. 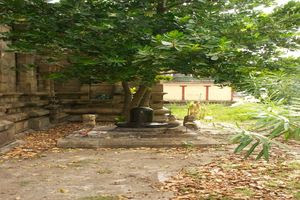 It’s one of the holy place “Tevaram has been sung on the primary god of the Shiva (Paadal Petra sthalam)”. From north side Chidambaram to The Mahendra Mountain totally 63 Shiva temples have been presented. 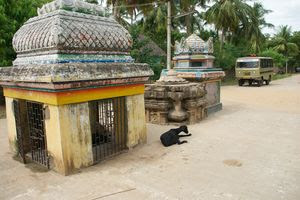 It’s also one of the part of 63 Shiva’s holy places. 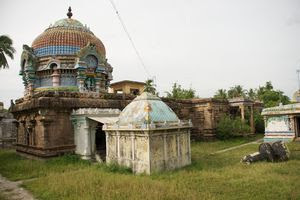 Once upon a time ponsei ruled under Chola dynasty. This is the birth place of Thiruganasambandar’s mother. 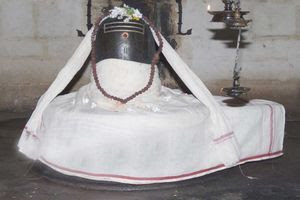 Thiruganasambandar has sung hymns in praise of lord Shiva Sitting on the shoulder of his father. 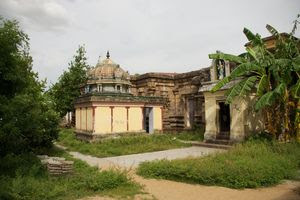 The place was once Paalai which was turned to Neithal, Forest, Paddy field when Sundarar Sung hymns in praise of Lord shiva of this temple. 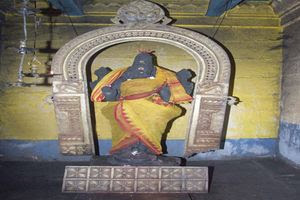 Panchamoorthigal sudhai sirpam at the entrance of gopuram. On the base of the karuvarai pudai sirpangal of Ramayana happenings to be seen. There is a significant correlation between Thirugnanasambandar and nanipalli. His mother Bhagwati was born in this place. 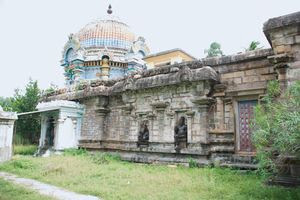 Thirugnasamabandar has sung a song to lord Shiva. Then this place has to change Parched wasteland to Seashore land, then he converted into Agricultural Land. So that Thirunanaipalli called Ponsei. After this incident sambandar called his named ThiruGnana Sambanthar. Please click on above images to enlarge. 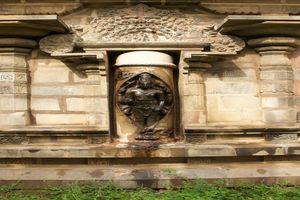 The sanctum sanctorum and the mandaps speak volumes of the aesthetic sense and architectural skill of ancient sculptors of Tamilnadu. 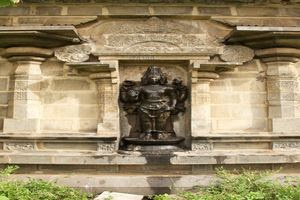 The entire beauty of the temple lies in the Nanipalli Kodi Vattam with a huge Lord Dakshinamurthy, Lords Subramanya, Brahmma, Lingodhbava and Chandikeswara with his consort. 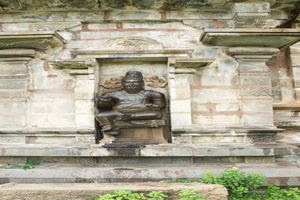 The temple was built by the ancestor of Raja Raja Chozha, king Panranthaga Chozha. People pray to Lord Kalyana Sundareswara for wedding boon and Lord Nattrunai Appar for excellence in education and prosperity. Devotees perform abishek to Lord and Mother and offer vastras. 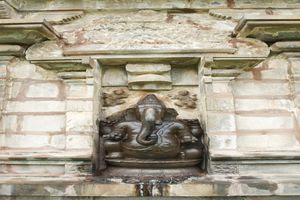 The sanctum sanctorum is very big in size that facilitated an elephant to worship Lord directly inside. 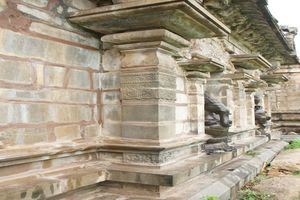 There are two Ambicas in the temples, Mother Parvatharaja Puthri and Mother Malayan Madanthai. 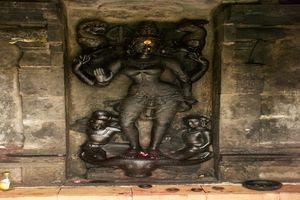 Lord Shiva granted His wedding darshan to Lord Vinayaka and Sage Agasthya. Mother is on the right of the Lord. Lord Kalyanasundarar graces with Mother Ambica from another shrine in the temple. Cauvery, though flows eastward turns here westward. This is called Basvamangini. Lord Vinayaka had to incur a dosha as he toppled the Kamandala-hand bowl of Sage Agasthya. For relief, he bathed in a tank here. 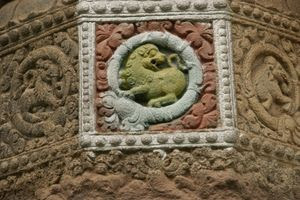 The place came to be known as Pon Sei which later changed as Punjai. 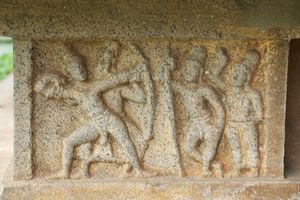 While Mother Durga appears in Shiva temples standing on the head of a buffalo, She graces here with a deer and a lion destroying the demons Sumba and Nisumba. 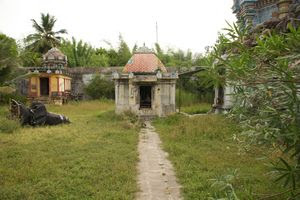 This is the place of birth of Baghvathi Ammayar, mother of Saint Tirugnana Sambandar. He sang the praise of Lord of the temple sitting on the loving shoulders of his father Shivapada Hrudhayar. The place was a desert-Palai in Tamil. 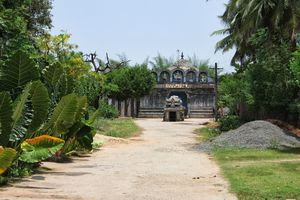 Yet, as wished by the devotees, he described this place as Neidhal-sea shore region. 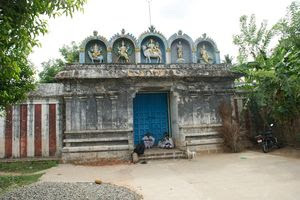 Location: This sivasthalam temple is located at a distance of 4 Kms from Semponar Kovil and is about 13 Kms from Mayiladuthurai. Phone: +91- 4364 - 283 188.